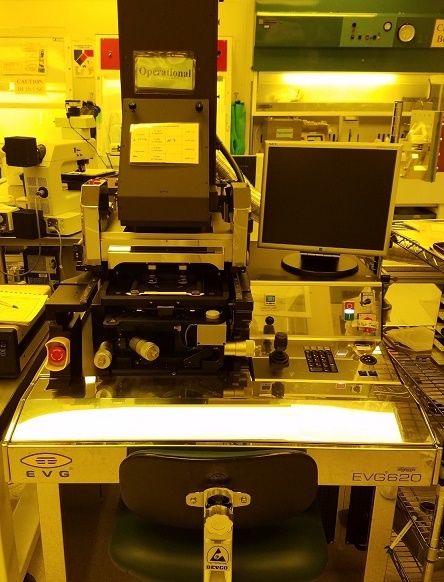 The Electronic Visions EV620 is an i-line system with double-sided mask alignment capabilities. The tool allows 4 inch and 5 inch masks and substrates sizes from pieces (1 inch) up to 4 inch wafers. The top side alignment offers 10X objectives for more precise alignment. The following parameters can be changed: exposure time, dose, contact mode, proximity gap of 0-300µm, and contact force. Exposure settings can be proximity, soft contact, hard contact, vacuum contact, and vacuum plus hard contact. The illumination uniformity for a 4 inch wafer is better than ±2%.